By LUDWIG VON KOOPA - Keep the Labo away from my vehicular treasures! Last week, however, Nintendo announced a global threat to transportation: Nintendo Labo: Vehicle Kit — due for a September 14, 2018 release. Given what we know about Nintendo Labo — it's highly dangerous and can possess cardboard objects and turn them against their owners — this is a unique threat to the Super Ludsub. The Super Ludsub, as the name suggests, is a brilliant submarine that is, get this, made of cardboard. Do you know what's in the Vehicle Kit? A car, a submarine, and a plane. ...And a pair of keys, the Toy-Con Keys, that reportedly enable the hijacking of any vehicle. That sounds EXACTLY like what I've been saying about how Cappy and the Labo have teamed up. Cappy and its Bonneter clan are interchangeable on anything (be it a tyrannosaurus rex, a statue, the Prime Minister of Japan, or Michael Jackson), allow for the friend of the Bonneter to transform (via possession) into an object or person, and then they very quickly become experts and can perform the role of that organism or object just as well, if not better, than they or their peers could. The Bonneters have somehow imbued their powers with the Labo, resulting in the horrifying combination you see on display with the Vehicle Kit and prior examples of the Labo's destruction. 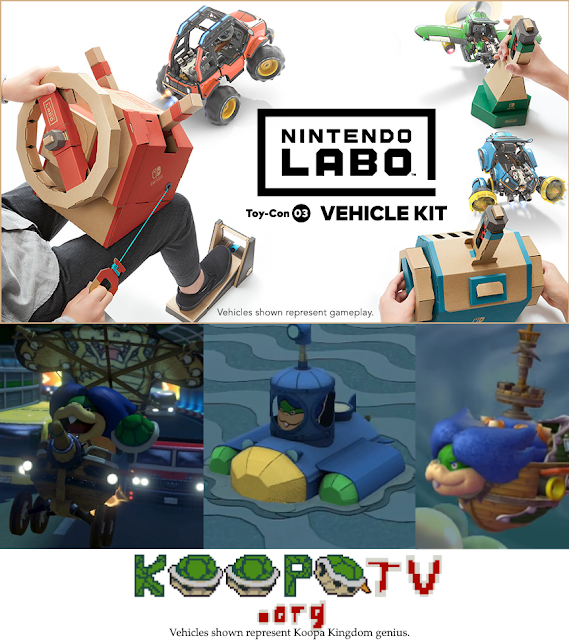 I am NOT going to idly sit by and allow this Labo-Cappy combination to dominate all of the vehicles of the world, especially not my Landship, my Super Ludsub, or my Doomship! KoopaTV has declared war on the Labo, and now you will see the true resources of KoopaTV and our patron Koopa Kingdom in full force against the Labo! Drive, dive, and fly with Ludwig's marvels of Koopa Kingdom genius! We shall obliterate every last shred of Labo and Cappy influence! Despite the three vehicles shown with Ludwig in them, Ludwig can't actually be in three places at the same time. Which do you think has the best chance against the Labo? The Landship? The Super Ludsub? Or the Doomship? Does the Labo-Cappy combination concern you and your family? You're now (if you weren't already) convinced that what KoopaTV has been saying all along is correct, yes? KoopaTV didn't start the war against the Labo (see here for its first strike), but we'll be happy to finish it. The Nintendo Labo: Vehicle Kit has now been released, to little fanfare but grave danger. The nature of how the Labo and Cappy have combined forces is made very clear in the fourth Labo Toy-Con, Virtual Reality. "Do you know what's in the Vehicle Kit? A car, a submarine, and a car." Two cars are greater than one car, but the submarine is still superior to both. The Super Ludsub is even more superior than these carboard creations and would blow them all out of the water. No matter how far Cappy's influence extends, he can never escape his fate. Alright, one vote for the Ludsub!